"According to the World Health Organization, "Health is more than the absence of disease. Health is a state of optimal well-being." "If you could choose to enjoy better health, would you be interested? Does increased energy, greater enthusiasm, and an enhanced sense of well-being appeal to you? How about a greater sense of joy? The good news is, these things are possible for you. Within yourself, you have the power you need to create wellness in your life. That power is your power of choice. Your health is your responsibility Many of us have been brought up to believe that our health depends solely on the quality of the healthcare we receive. The truth is, your health is your responsibility. You are the only person who can make the lifestyle decisions that contribute to your well-being." ~The American Holistic Health Association. Donate Online Heart To Heart Healing "Energy Healing for people, animals and environments; private sessions and classes. Pranic Healing is a no-touch modality that can address physical issues (both chronic and acute), as well as mental/emotional issues such as stress, depression, anxiety, addictions and phobias. Pranic Healing works local and long-distance." Doc is lucky enough to live with his mom, Liza. A Healthy Practice in Portland Oregon brings almost 20 years of Macrobiotics expertise to you. Choose from colon hydrotherapy, liver cleanse, individualized weight loss, herbal support or special nutritional programs specific to the person. Linda is a gentle healer who also knows a thing or two about the dietary and herbal needs of your animal friends. Stella, Carlie and Sammy have shared their holistic lives with their mom, Linda. Modern pharmaceuticals, such as antibiotics are very effective at symptom elimination of many diseases and are frequently prescribed in the "one size, one antibiotic fits all" theory. Elimination of the SYMPTOM is NOT the same as elimination of the disease. Masking or stoping the symptoms only drives the dis-ease deeper into your body making an eventual recovery or cure more difficult. The Holistic approach treats the entire individual, whether human, dog, cat or horse and seeks to find the CAUSE of the illness. Without knowing the cause, how can anything be cured? Reclaiming optimal health requires you to stop putting the harmful things into your body that contributed or caused the problem to develop. You may need to consider an organ cleanse to completely rid your body of all toxins. Then supply your body with the needed nutrients to repair and rebuild itself and use your immune system to ignite your body's internal healing force and stimulates the body's natural abilities to heal itself. Healing is a process and there aren't any instant pills to cure chronic problems. "Dogs, cats and other animals live for years on foods that come out of bags, cans and boxes. But do these foods promote health? If they did, our companion animals would enjoy long, happy lives free of arthritis, hip dysplasia, eye problems, ear problems, fleas and other parasites, gum disease, lick granulomas, thyroid imbalances, skin and coat problems, personality disorders, birth defects, breeding problems, diabetes, cancer and other major and minor illnesses. Before World War II, most North Americans fed their pets raw bones and table scraps. Today, everyone uses convenience foods, and pet food companies are industry giants. Diet isn't the only thing that has changed. So has life expectancy, with the life span of many breeds now less than half what it was two or three decades ago. Skin and coat problems are so common that we accept them as unavoidable, and today's vets routinely treat conditions that used to be unusual or even rare." Dr Wendell O. Belfield, D.V.M. "Their pets may have diarrhoea, increased flatulence, a dull hair coat, intermittent vomiting or prolonged scratching. These are common symptoms associated with commercial pet foods." In 1981, as Martin Zucker and I wrote How to Have a Healthier Dog, we discovered the full extent of negative effects that commercial pet food has on animals. Brandon Brooks, DVM - "Many (if not most) Over The Counter (OTC) or non-prescription flea control products are very toxic to cats and kittens, especially the ones only approved for use in dogs. Many people mistakenly buy these for their pet, it's not always their fault, the companies that make them want you to buy it, they don't really care about the dangers involved, so it pays to be extra careful when buying flea control products." None of Happy Tails Rotts have ever had a single flea. Fleas are opportunistic, they only go after animals with compromised immune systems. How can it make any sense to put toxic chemicals on an animal that is already not healthy? 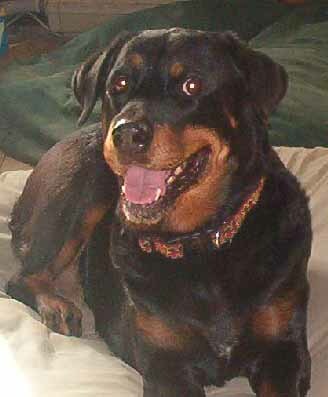 Happy Tails enjoys teenage Rotts, who didn't come to us as puppies. We attribute their robust health to all natural care, fresh unchemicalized water, natural foods and no drugs. Think of the years of life that your dog might be losing because of what he's eating or the drugs and toxins that go onto or into his body. In February 1990, the San Francisco Chronicle carried a macabre two-part story detailing how stray dogs and cats and pound animals are routinely rounded up by meat renderers and ground up into -- of all things -- pet food. According to Keith Wood, thc researcher who brought the information to the Chronicle, the paper buried the story and deleted many of the charges Wood had documented. A report Wood worked on for ABC elevision's 20/20 was similarly watered down. The rendering plant floor is piled high with "raw product". housands of dead dogs and cats; heads and hooves from cattle, sheep, pigs and horses; whole skunks; rats and raccoons -- all waiting to be processed. In the 90 degree heat, the piles of dead animals seem to have a life of their own as millions of maggots swarm over the carcasses. Two bandanna-masked men begin operating Bobcat mini-dozers, loading the "raw" into a ten-foot deep stainless steel pit. They are undocumonted workers from Mexico doing a dirty job. A giant auger-grinder at the bottom of the pit begins to turn. Popping bones and squeezing flesh are sounds from a nightmare you will never forget. Rendering is the process of cooking raw animal material to remove the moisture and fat. The rendering plant works like a giant kitchen. The cooker, or "chef", blends the raw product in order to maintain a certain ratio between the carcasses of pets, livestock, poultry waste and supermarket rejects. Once the mass is cut into small pieces, it is transported to another auger for fine shredding. It is then cooked at 280 degrees for one hour. The continuous batch cooking process goes on non-stop, 24 hours a day, seven days a week as meat is melted away from bones in the hot "soup". During this cooking process, the "soup" produces a fat of yellow grease or tallow that rises to the top and is skimmed off. The cooked meat and bone are sent to a hammermill press, which squeezes out the remaining moisture and pulverizes the product into a gritty powder. Shaker screens sift out excess hair and large bone chips. Once the batch is finished, all that is left is yellow grease, meat and BONE MEAL. Read Entire Article, clicking on above link. Then read your dog food label of ingredients. The practice of boiling down euthanized dogs and cats for industrial fat and protein causes an uproar in St. Louis. -- It started with footage of Blacky and Scoop, melt-your-heart dogs with no one to claim them, alone at the city pound--and due to be put to death within hours. "No one wants them. Alive, that is," the reporter said. The film then cuts to a rendering plant that boils down the city's euthanized dogs, along with dead pigs and cows from local farms and leftover bones, hooves and innards from slaughterhouses. The end products are used to make cosmetics and fertilizer, gelatin and poultry feed, pharmaceuticals and pet ood. It was the pet food that got people. The report last month by KMOV-TV's Jamie Allman--headlined "What's Getting Into Your Pets" --suggested that dead dogs and cats from local shelters were ending up in kibble. As proof, Allman aired footage of a tanker truck entering the rendering plant, a truck emblazoned with the motto "Serving the Pet Food Industry." Pet Owners went nuts. Click on above link for entire article. Here are a couple videos if you can stomach it. The point is not to horrify, the message is to only feed your aninmals that which you would consider eating. When you consider how long this practice of euthanized "shelter" animals have been KNOWN to be included in commerical pet food, it casts a different shadow on understanding on WHY many shelters are so Pro kill. There is a lot of revenue at stake, the sale of all the dead animals (injected with toxic drugs to end their lives) The profitable rendering business of turning discarded garbage into tasty commercial pet food. When these dots are connected, it paints a picture as to why shelters prefer killing. Does this help clarify why our animals have such dismal health issues and die early? What do YOU think? Food Pets Die For Why Is Cancer Killing Our Pets? Ground Yellow Corn is the entire ground up ear of corn excluding the husk. 90% +/- of Corn is GMO and a major source of allergies. including the cob but without the husk. Chicken By-Product Meal Rendered, ground parts of chicken, including heads, eyes, necks, bones, blood, feathers, feet, intestines, undeveloped eggs, beaks, internal organs, may contain disease or contaminated tissue. Corn Gluten Meal More difficult to digest, allergy causing dried residue from corn, a cheap filler causing organ damage to kidneys and liver. Whole Wheat Flour Another process allergen, dogs are carnivoires and do not naturally eat grains. Beef Tallow Rendered cattle are those unfit for human consumption, dead or dying, tallow is created from their fat to add flavor, could include restaurant grease too. Rice Flour Highly processed, vitamin free, a filler of starch & gluten, difficult to digest, no nutritional value. Soy Flour 91% + of all Soy is GMO, causes allergies, hormonal damage, organ damage and we consider is unfit even if organic, it is not a health food. This poor quality, dangerous filler is from soy bean flakes. Sugar More refined junk to be avoided, considered an anti-nutrient. Animal Digest Rendered animals of all types, road kills, lab animals, fetal tissues, organis, diseased or slaughtered shelter animals with all of the drugs in them, includes intestines with stool, parasites & bacteria. Everything is boiled, melted, blended and dumped into cheap dog & cat foods. Salt Not nice sea salt, normally a chemical mixture which inludes real salt, and not needed. Potassium ChlorideUsed to replenish electrolytes, also used in fertilizers and for lethal injections. And then the ingredients just go downhill from there, more garbage & harmful preservatives. Where is the nutrition? Truthly if you buy supermarket dog food, you're contributing to disease, sickness and the early death of your dog. Did you know that an 85 lb dog, who eats commercial junk kibble, ingests about 50 lbs of artificial preservatives each year? Is it any surprise that so many dogs suffer from dry skin, allergic reactions, dental disease, poor health, lack of energy, and degenerative organ dysfunction? How much does your dog weigh? Does he eat commercial kibble with artificial preservatives? Rendered animals including all of the owner surrenders who really, really love their dog, and are just "heartbroken" BUT turn their family dog into a shelter anyway end up in cheap dog foods. The secret has been out since the early 90's. Clearly there are millions of dead human and animal bodies that must be safely disposed of, but is eating them the best solution? As a rescue with many senior animals, we've used burial, but that isn't always immediately possible, like when the ground is frozen or covered in several feet of snow. We've also used cremation, but that's a 80 mile round trip drive and they aren't always available. After much frustration, thought and research, we turned to a Washington state approved method of animal body disposal. We compost and return the body's nutrients to the soil, very natural, very clean, no odors, no rats, just very efficient, easy and not stressful. We have a 10 x 10 dog run that we use (apart from everyone) to keep chickens from rooting through the straw and use it for an interm resting area before being returned to the soil, providing nutrients to enrich the soil and complete the circle of life. On Farm Composting of Livestock Mortalities Washington State Department of Ecology. "These guidelines provide the basics of composting large livestock as one possible animal mortality management tool. Proper composting of other types of livestock is allowed in Washington but is not covered in this guidance document. The focus is on managing what is considered routine, day-to-day livestock mortalities, and is not suitable for managing mortality due to reportable diseases." Gosh, they don't advise us to eat them! As the American Journal of Veterinary Research explains, the recycled meat and bone meal is used as "a source of protein and other nutrients" in the diets of poultry and swine and in pet foods, with lesser amounts used in the feed of cattle and sheep. Animal fat is also used in animal feeds as an energy source." Every day, hundreds of rendering plants across the United States truck millions of tons of this "food enhancer" to poultry ranches, cattle feed lots, dairy and hog farms, fish feed plants and pet food manufacturers where it is mixed with other ingredients, to feed the billions of animals that meat-eating humans, in turn, will buy from their supermarket and eat. So with him (the vet) saying this, I agreed to the ProHeart 6 injection along with his Rabies, Bordetella, DHLP-PARVO-CORONA. When I picked Chaos up, the doctor told me that he was in good health and what a good natured dog, for being the breed he was. I really never noticed that Chaos was not feeling well, due to him being an outside pet.  On November 2, 2003, I noticed that he had not eaten his food. I talked to him and pampered him and let him come in the house and he just laid around and acted sluggish. I thought he was just enjoying being inside. On November 3, 2003, I noticed he did not eat again and when he tried to get up, his little back legs were shaking and I knew then he was sick. My husband picked Chaos up and brought him back in the house. But Chaos just laid there, and attempted to crawl to the door to get out. This was happening at night and I called the emergency night clinic. They told me I needed to bring him in. By the time we got ready to take him in.... he was laying on his side. Chaos looked up at me and laid his little head down and died. This was the first time he had ever had the PH6 injection. If only this veterinarian had read this letter, my precious Chaos would still be alive today. This is not acceptable to me and I plan on filing a complaint against this veterinarian with the State Board. I encourage anyone that feels their veterinarian has not followed the instructions supplied to them by the manufacturer of this drug, to also do this. It may help save other dogs lives. Myra lost a perfectly healthy 6 yr old Shih tzu after Proheart 6 shot (heartworm prevention). He started having diarrhea and vomiting within 5 days of the Proheart 6, and over weeks continued digestive problems. Her dog died. "Adverse Reactions: The following potential adverse drug reactions (number of cases) were observed in the moxidectin injectable treatment group: vomiting (3), diarrhea (2), weight loss (2), listlessness (1), seizures (1), injection site pruritus (3), elevated body temperature (1). Injection site evaluations of the ProHeart 6 treated dogs revealed no abnormalities. Two geriatric dogs with a history of weight loss after the initial ProHeart 6 injection died within a month of the second 6-month injection. A third dog who was underweight for its age and breed and who had a history of congenital problems experienced lethargy following the initial injection of ProHeart 6. The dog never recovered and died 3 months later. Treatment with ProHeart 6 could not be ruled out as contributing to these observations." Thank you for purchasing ProHeart 6 (moxidectin), Fort Dodge Animal Health's innovative product for six-month protection against heartworm infection in dogs. The purpose of this letter is to provide you with some new information egarding a recently approved label indication for ProHeart 6, as well as a review of the adverse events that have been reported for he product during its introduction into the marketplace. This update on the performance of ProHeart 6 reflects our desire to share information that has been learned about the product after its first year on the market. Post-Approval Experience: although not all adverse reactions are reported, the following reactions are based on voluntary post-approval drug experience reporting: anaphylaxis/toid reactions, depression/lethargy, urticaria, and head/facial edema. As with anaphylaxis/toid reactions resulting from the use of other injectable products, standard therapeutic intervention should be initiated immediately. Since introduction, we have received and tracked reports from practicing veterinarians regarding adverse events subsequent to the clinical use of Proheart 6. A review of these reports is presented below and includes events observed when ProHeart 6 was administered alone, as well as those observed when given with concurrent medications. The numbers presented are unfiltered, as reported to CVM, which include observations subsequently determined to be unrelated to product administration. During the first twelve months of product use, 105 reports of site reactions post administration (.0016% of doses sold into veterinary clinics) have been received. These events are predominantly swelling, pain, and/or pruritos that are observed post administration. The vast majority are self-limiting in nature, though selected cases have been treated with anti-inflammatories, and in some cases, antibiotics. A total of 946 reports of allergic responses post administration (.015%) have been received. As with vaccines, this category represents the most frequently reported event. Most of these reactions are mild and have responded to standard medical intervention. Some, however, have been more severe, including a small percentage of anaphylaxis cases. The most frequently reported effects have been vomiting and diarrhea, followed by angioedema and/or facial swelling, urticaria and gastrointestinal symptoms. Other less common events include ataxia, weakness, dyspnea, pale mucous membranes, lethargy and fever. A total of 685 reports of illness post administration (.011%) have also been received. This category encompasses a wide variety of reports that are received in a broad timeframe (from one day to several months) post administration. There is overlap with the allergic events where both allergy and additional symptoms were recorded. The most frequently reported signs have been vomiting and diarrhea at variable time frames post administration, seizures or other neurological signs and lethargy. Other rare, but more serious reports, include erythema multiforme in 3 cases and autoimmune hemolytic anemia in a low number of patients, most of whom had received vaccines concurrently. Could Your Pet be in Danger? AIHA Canine autoimmune hemolytic anemia (AIHA) is a disease characterized by increased destruction of red blood cells (erythrocytes) by the dog's own immune system. This was the disease one of our adopted Rotts got after a single rabies vaccine. She survived and is thrived 5 beautiful years in spite of modern medicine. Dr. Rob Robertson, M.D writes "Nearly everything that goes wrong with us and our pets, with the exception of trauma - i.e. broken bones, etc., can be traced directly to an immune system failure". Pollution, drug overload and nutrient-poor diets compromise our immune health. 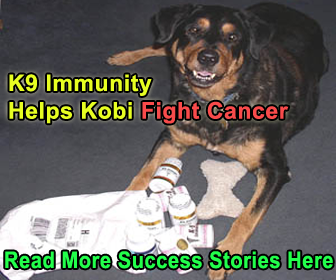 The key to self-healing is a strong defense system, which protects dogs and cats from everything from the flu germs to cancer cells. More than their mainstream counterparts, holistic veterinarians believe that a weak immune system plays a key role in causing disease. Drugs aren't the answer for immune enhancement. The immune system is not responsive to drugs for healing. Antibiotics fight infection, but they don't affect whatever weakened the immune system in the first place. 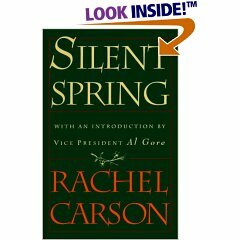 This is why holistic veterinarians focus less on things that cause diseases and more on those that affect the body's defenses"
Amazon.com Review: Silent Spring, released in 1962, offered the first shattering look at widespread ecological degradation and touched off an environmental awareness that still exists. Rachel Carson's book focused on the poisonsfrom insecticides, weed killers, and other common products as well as the use of sprays in agriculture, a practice that led to dangerous chemicals to the food source. Carson argued that those chemicals were more dangerous than radiation and that for the first time in history, humans were exposed to chemicals that stayed in their systems from birth to death. Presented with thorough documentation, the book opened more than a few eyes about the dangers of the modern world and stands today as a landmark work. Tired Of GOOGLE's Restricted Searches? GoodSearch.com is a Yahoo-powered search engine that donates half its advertising revenue, about a penny per search, to the charities its users designate. Use it just as you would any search engine, get quality search results from Yahoo, and watch how the donations really add up! All you have to do is click on the link and make sure that it shows Happy Tails as your favorite charity. It doesn't cost you a cent, but earns us one. Please? GoodShop.com also offers a convenient, exciting online shopping mall which donates a portion of each purchase to your favorite cause! That's us, right? Hundreds of great stores including Amazon, Target, Gap, Best Buy, ebay, Macy's and Barnes & Noble have teamed up with GoodShop and every time you place an order, you'll be supporting your favorite cause. Since it doesn't cost you anything and you get proven search results, can you think of any reason not to use it? We hope you'll not only use GoodSearch.com as your main search engine from now on, but will also tell your friends, family and co-workers so they, too, can start using GoodSearch to support their favorite cause! Every little bit really does add up and can make a big difference for Happy Tails and the animals it supports. Why wouldn't you want to do it? There's a little Napa Valley in everything we do! Happy Tails Newsletter will be offering exciting training tips, educational, natural health information and specials on our Natural Farmacy collections, formulated for Mutts & Men, Nags & Hags, Fillies & Friends & Ewe Too! Our focus covers many hot topics ignored by the Industrial media, corruption, politics, natural health, radiation poisoning, indigenous populations, activism and social reflections of this time on Planet Earth. Find out what your dog might really be saying to you? Can he trust and believe your body language? If you were a dog, would you pass a "temperament test' ? Does your dog respect you or treat you more like a chew toy? Can you really share your Mango Orange Extreme Body Butter with your pooch? Report An Adverse Drug Experience With The FDA We encourage you to report all adverse drug experience, it may help save another animal's life. Adverse effects may show up weeks or months after the drug or vaccination. Are You Stimulating Your Dog's Intelligence - or is he Challenging YOURS? Happy Tails enjoys affiliate relationshps with these quality merchants. We purchase our herbs, oils and remedies from them and will earn a small percentage from your purchases. These relationships may change if we experience poor quality products or service. We appreciate your support and hope you consider these merchants.